Lack of long-term hydrological monitoring makes it difficult to determine impacts of changing land use on the water dynamics for many catchments in Africa. Here we use local ecological knowledge (LEK) to explore the impacts of rapid expansion of eucalyptus agroforestry on water security in the Ethiopian highlands. Local knowledge about the impacts of changes in tree cover was collected from farmers (n = 30), extension staff (n = 2) and timber merchants (n = 2) in five kebeles within the Jeldu woreda. Jeldu has undergone significant land use change over the last forty years. The area was heavily deforested 20 years ago and farmers associate this time with a major change in the water dynamics. Recently the development of a new road to Goja, the main town, opened up the area as a source of timber for Addis Ababa. This has resulted in a substantial expansion of eucalyptus plots adjacent to roads on the upper plateau and in riparian areas where growth is accelerated. Poorer farmers have been displaced on to the sloping land (which used to be woodland) where there is now evidence of rapid soil degradation. The key findings were that farmers identified significant trade-offs at the plot scale between eucalyptus and adjacent crop fields. They also identified indicators suggesting the sudden increase in eucalyptus cover had accelerated declines in water availability at landscape scales. The study showed the value of using LEK for exploring immediate landscape scale dynamics in the absence of hydrological monitoring. Whilst there is a degree of uncertainty surrounding the impacts of eucalyptus, this research demonstrated local awareness associated of problems associated with unregulated expansion of eucalyptus woodlots on the water regulating capacity at immediate landscape scales in the Ethiopian highlands. It documents a decade of research, methodological innovation, and lessons learned in an eco-regional research-for-development program operating in the eastern African highlands, the African Highlands Initiative (AHI). It does this through reflections of the protagonists themselves—AHI site teams and partners applying action research to development innovation as a means to enhance the impact of their research. This book summarizes the experiences of farmers, research and development workers, policy and decision-makers who have interacted within an innovation system with the common goal of implementing an integrated approach to natural resource management (NRM) in the humid highlands. This book demonstrates the crucial importance of “approach” in shaping the outcomes of research and development, and distils lessons learned on what works, where and why. 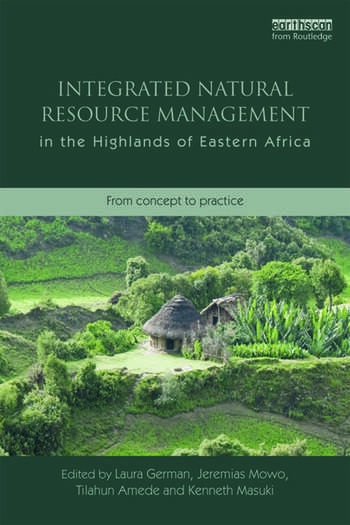 It is enriched with examples and case studies from five benchmark sites in Ethiopia, Uganda, Kenya, and Tanzania, whose variability provides the reader with an in-depth knowledge of the complexities of integrated NRM in agro-ecosystems that play an important role in the rural economy of the region. It is shown that the struggle to achieve sustainable agricultural development in challenging environments is a complex one, and can only be effectively achieved through combined efforts and commitment of individuals and institutions with complementary roles. experiences with a set of approaches employed to operationalize participatory watershed management through an integrated lens which looks not only at soil and water but at a wider set of system components and interations. Chapter 4 explores lessons learned to date on methods and approaches for participatory landscape governance, exploring how processes that cut across farm boundaries, involve trade-offs between different land users or require collective action may be addressed effectively and equitably. Chapter 5 explores the role of district level institutions and cross-scale linkages in supporting grassroots development and conservation initiatives, including improved coordination and better support to local livelihood priorities and bottom-up governance reforms. Chapter 6 explores methods and approaches for scaling up and institutionalizing integrated natural resource management innovations (e.g., those presented in earlier chapters), as well as approaches for self-led institutional change that can institutionalize the process of methodological innovation and impact-oriented research.